Heavy hearts, this weekend. The stark reality of our world can be overwhelmingly sad but we must hang on to love, tolerance, respect, joy, beauty, compassion and hope. I’m joining in with Cathy at Rambling in the Garden for her weekly gathering of beautiful flower arrangements. It seems particularly appropriate to be appreciating beauty where we can find it. The garden has been battered by heavy winds and rain all weekend and we woke up to more grey and driving rain this morning. 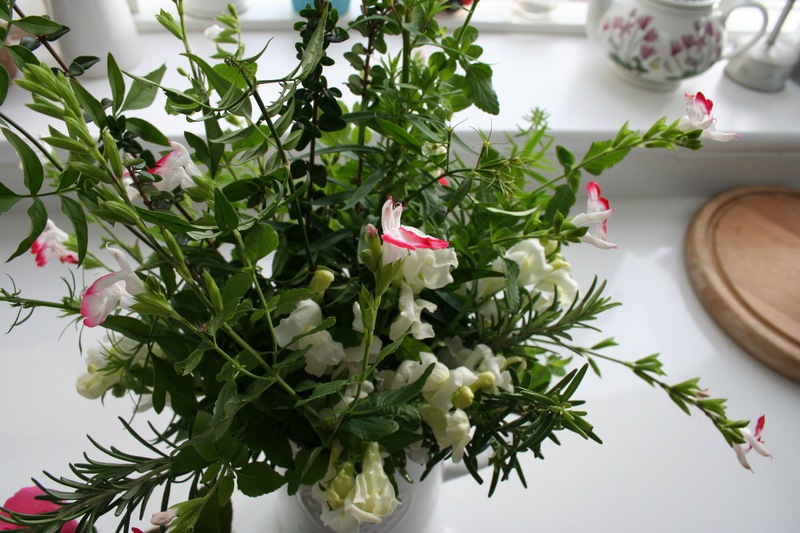 It stopped raining about an hour ago, the clouds parted and the sun came out (fleetingly), so I rushed out into the garden, scissors in hand, and snipped some Salvia ‘Hot Lips’ and white snapdragons, and foliage from rosemary, Lonicera nitida, jasmine and Lysimachia. It smells delicious. I also cut a pink rosebud from the unknown climbing rose at the front of the house, which you can just see bottom left in the picture below. So lovely, and in November too. And you’re absolutely right about not losing our appreciation of the vital importance of all the good things in life and about people. 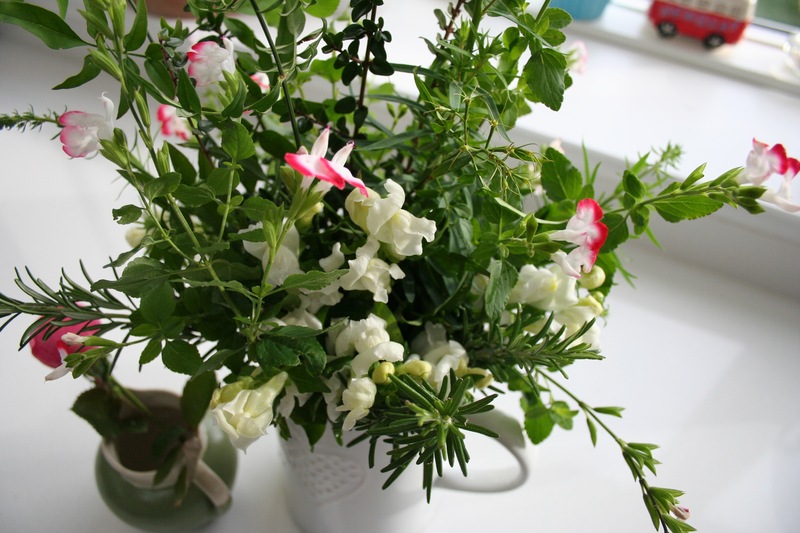 Your vase is a treat with that salvia and the white snapdragons…a lovely mix of deep green foliage too! Perfect! What a summery, delicate-looking vase, perfect. Yes, Sam – such a touching tribute. Donna of Garden Eye View shared this quote some time ago, and I am always mindful of it when contemplating man’s inhumanity to man… ‘If we could see the miracle of a single flower clearly, our whole life would change’…. If only everyone stopped long enough to see such a miracle the world would be a very different place…. It is important to properly look and notice beauty in nature. It takes us out of our bonkers world for a bit. I appreciate the way you look for beauty in the simple things, especially when the world can be so cruel. Your flowers are beautiful and delicate, and they make me happy to look at them. Thank you. I hope you have a good week, take care. It’s lovely, Sam, as is the sentiment at the top of your post. Re the vase, I don’t think I’ve seen that Salvia used in a more effective way. A lovely fresh vase, I love it. We have all been in a state of shock this weekend, all the more reason to reach out to like minded people and share our love of flowers and the things that make life precious. You are so lucky to still have some gorgeous flowers in the garden. It is good to celebrate the good things, especially when the weekend has been dominated by evil. It’s especially important to celebrate the good things now, isn’t it. 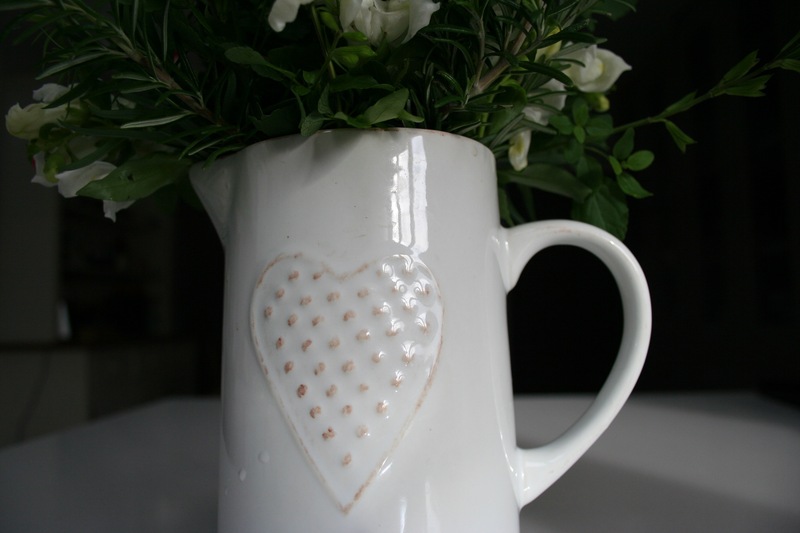 J’adore your lovely jug. Vive La France. 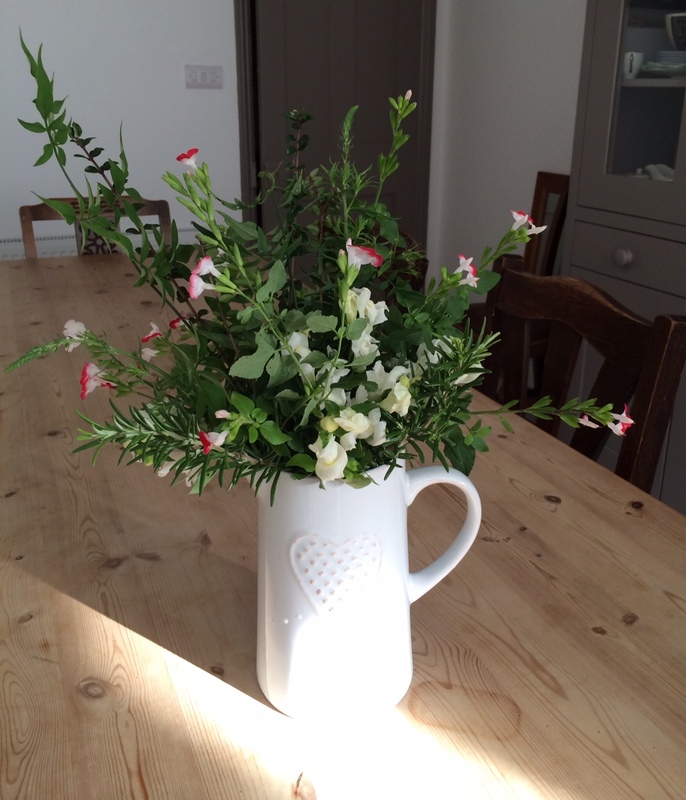 Beautiful flowers in a gorgeous jug Sam…so peaceful. Heavy hearts indeed. But at such times we need flowers more than ever. A very pretty vase Sam – I like that salvia and would like to grow it one year (as an annual here). We planted ours last June. I cut it back to about 20cm in early spring and it’s grown to about 1.2m over the summer/autumn. It’s obviously happy where it is and is very pretty.